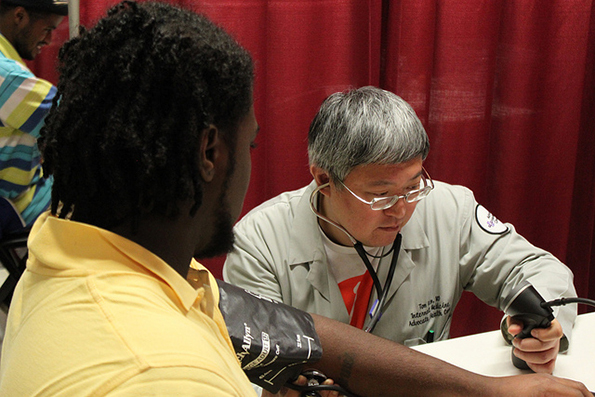 Volunteer Mary Manley visited the 15th annual MedFest at United Center in Chicago to hear from doctors and athletes about why this event is so important to each of them. 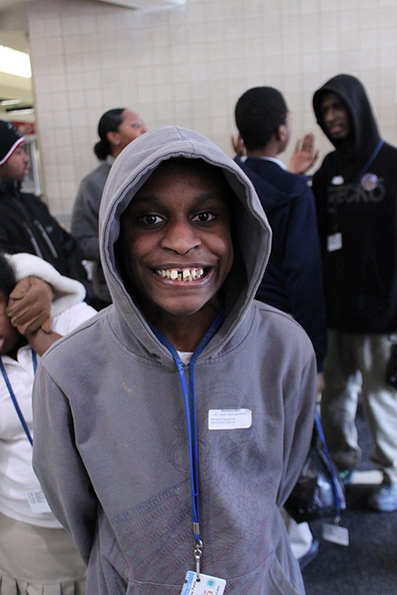 It is worth celebrating that this is the 15th year Chicago MedFest has been making the seemingly impossible happen. 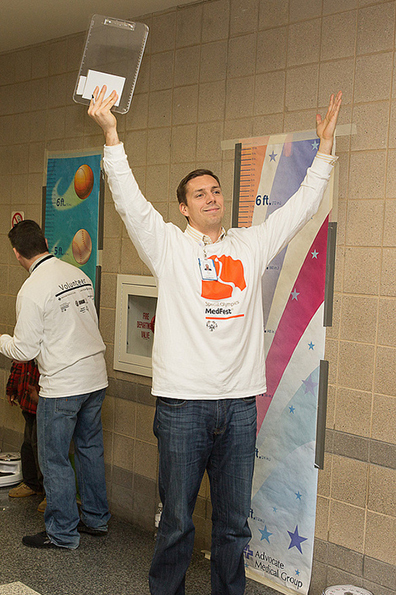 Hundreds of volunteers from Advocate Medical Group, Illinois College of Optometry, Lions Clubs International, United Center and GE joined forces with Special Olympics Illinois on November 13, 2013. 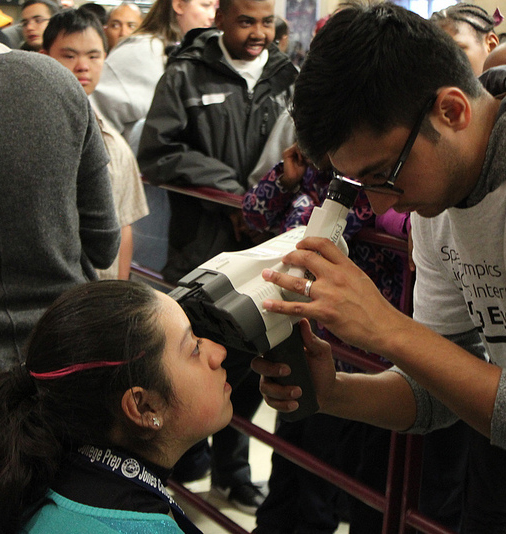 Over the course of only five hours, 1,434 aspiring and current athletes received physical exams necessary for their participation in Special Olympics. Many hundreds also had vision screenings and received free glasses if needed. The reason for this annual event is to insure that every one who wants to participate in Special Olympics can. Not exactly a dramatic beginning. But like many things on this day, what is said only in words or numbers leaves out the best part of the story. Like the huge enthusiastic grins that went with this athlete’s answer to “How is MedFest?” and “What do you think of Special Olympics?” Only when those grins are added in do you begin to capture the excitement of the day. It is visible in the faces of just about every one at MedFest. Of course MedFest has had its dramatic moments. For example some years back at MedFest a doctor caught a life-threatening heart condition that literally saved a child’s life. But again, there is something worth celebrating in the relative absence of this kind of story today. As one doctor who has been coming virtually every year since MedFest’s beginning said, “I got regulars now.” The rarity of drama is a testament to the benefits of consistent exposure to quality health care. And MedFest provides that. 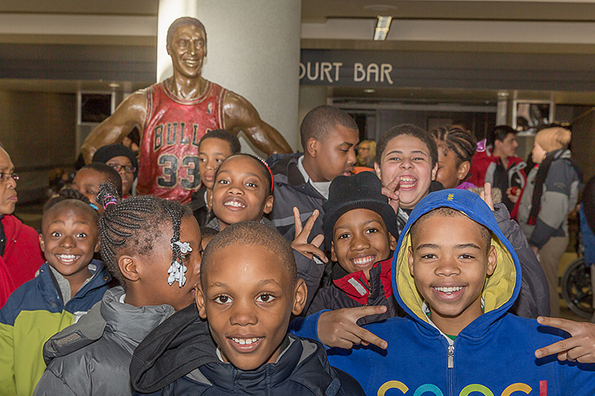 In that same vein, everyone can appreciate the generosity of United Center. It has opened its doors and staff to MedFest for the 15th year in a row now. But the United Center brings more than lots of free space to the party. It brings the World Champion Chicago Blackhawks out to practice on the ice. Can you imagine the excitement of getting to watch the Blackhawks practice live while you wait to see a doctor? Now factor in the occasions when an athlete received a signed hockey stick or a doctor got a puck. The personal connections made may be remembered even longer than all the excitement. One of the coaches shared a story about Samantha, one of her athletes. The story illustrates something else the athletes have to teach us. It also explains why, if you tell Samantha that you hear she is a runner, she will give you a smile that will stay with you for the rest of the day. When Samantha first started training for Special Olympics, walking the few blocks between her school and the park was daunting. In fact, she had to sit down and rest to do it. So, when Samantha was ready to run a 50-meter race at a Special Olympics event, she was rightfully proud. But luck was not on Samantha’s side. Through one of those cosmic mix-ups, Samantha ended up in the wrong place – at the site for the 100-meter race. Samantha had never run a 100-meter race in her life. To make matters worse, the race was already finished. But the referees could see that Samantha really wanted to run. They explained that she could not win anything officially. However, if she still wanted to run it was OK with them. Samantha was psyched. She ran the track. Her first 100-meter race ever and it was without the benefit of competitors to either help pace or motivate. In the meantime, her coach was not aware of history being made across the field. All she knew was that she wanted Samantha to have a chance to shine in the 50 meter. So she negotiated for Samantha’s 50-meter heat to be moved to a later slot. That gave her time to locate Samantha. The field between the two races loomed larger than usual to Samantha after her 100-meter adventure. Still Samantha did not give up. She arrived just in time for the rescheduled race. Of course, Samantha was no longer on an even playing field with her competitors. But she ran anyway – because Samantha has the spirit of a champion. That is the spirit Samantha and so many of these athletes have. And, perhaps because of their example, it shows up in the people around them surprisingly often as well. It makes one wonder if SO should have a duel meaning – Special Olympics and Spirit Olympics. It seems appropriate to end with a quote from a 15-year old athlete. When asked what she would like to say to the doctors (and all the organizations and many volunteers) at MedFest, Robin became very thoughtful. She took the offer seriously. Suddenly her face broke into a smile and she spoke from her heart.